never cease thrilling his crowd. Les Productions Jeremy present Jeremy James, acclaimed magician and illusionist for over 20 years, with a young and dynamic crowd. With more than one trick up his sleeve, and Ungavaa the Snow Lion King by his side, Jeremy James manages to surprise and amaze children with his family show, including, among other amazing tricks, animal appearances such as rabbit, parrot, duck, dove and many others, to the pleasure of all. Whether during its famous Christmas show presented throughout the year, or other presentations adapted for an elementary or high school crowd, as well as another one for corporate events or otherwise, teenagers and adults are also touched by his show. 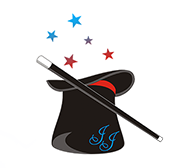 With his magician hat and magic wand in hand, Jeremy James promises a colorful experience and many surprises every time. The route taken by this magician and illusionist makes him a versatile and generous artist who lets sharing fun of magic and wonder take center stage.